One of the greatest perks of living in a culture different from your own, is living in the culture different from your own. I realize this may sound kind of obvious, but the truth of the matter is, many Third Culture Kids and their families can have a tendency to stick to their comfort zones. Often the comfort zone becomes the International School the TCKs are attending and the work settings that have brought the families abroad in the first place. It can be familiar to speak English and enjoy hearing familiar phrases around you, and easy to slip into the comfort of what and who you know. But easy doesn’t necessarily mean better, and for TCKs, there’s a lot of living to be done outside of the comfort zone. Last weekend was one example of what the local Austrian life has to offer. At the suggestion of a former colleague who relocated and encouraged a reunion, we made our way to the small Tyrolean town of Soll, Austria (there’s supposed to be the double dotted umlaut over the O, but I haven’t gone local enough to figure out how to make it work on my computer). Pairing up with other expats who were feeling adventurous, we loaded into a van and headed off for our first Almabtrieb. Basically, this term means a descent of the cows from their summer Alpen meadow vacations. And it also means a big party. Because the cows can’t come back to their farms to pass the winter months without a celebration. And boy, can the local villagers celebrate. First there’s a parade in town as farm families head up the hills to gather their cows for their reappearance. People wear their finest Traechten, or traditional clothing, the women in colorful Dirndl dresses and the men in their durable Lederhosen, or leather shorts. They parade through town accompanied by tractors, as they head off to gather the cows. And then the onlookers wait. But there are a few diversions to keep them occupied. Pretty young girls walk around with small tapped barrels dispensing local Schnapps of fruity varieties such as pear (Birne) and apricot (Marillen). Bands play traditional music that includes an awesome dose of oompah,well known waltzes and sing-along favorites. Regional delicacies such as Bratwurst and Schweinehaxe are abundant and enjoyed. Local shops display their finest in souvenirs such as linens, decorative bottles of Schnapps and cowbells. For our first Almabtrieb, the day turns out so much warmer than expected, I have to do some shopping myself. Having opted for a pair of jeans and a traditional knitted, patterned sweater, I find myself hot even before I sample a Schnapps. Non-natives have a tendency to break tradition, and I opt for a pair of Lederhosen knock-off shorts to keep comfortable for the day. Okay, and I’ll admit to falling for the bottle of Edelweiss adorned Schnapps and a cool traditional hat, as well. 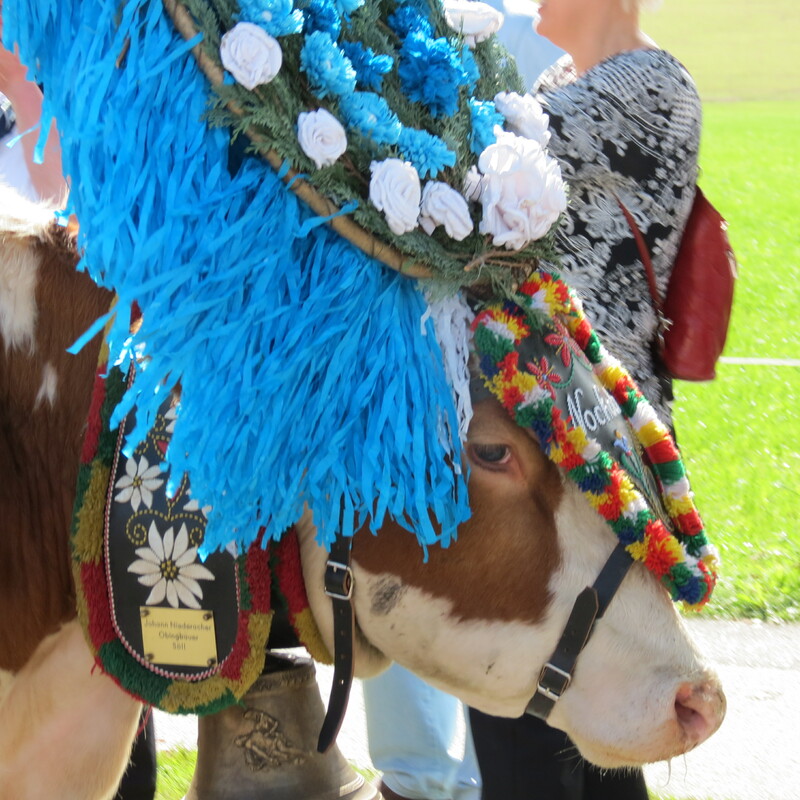 Not too far into our shopping spree, we start to hear cowbells and the first group of cows parades through the town. Did I forget to mention that it’s a bit of a bovine beauty pageant? Cows wear crowns of ornate flowers, weaved straw, and written blessings and sayings. The head-wear reminds me of Ascot attire, adorning the well-received dairy delegations who sporadically make their presence known, cowbells ringing and young and old farm hands chaperoning. One of the best parts of going local, is mixing it up with the people of the town. We were fortunate enough to grab photos with an elegantly adorned senior couple, share a Schnapps bottle with some of the young farmhands who were doing their own celebrating after safely delivering their cow cargo, and pass many a hiker with a “Servus” on a late afternoon hike complete with a downpour that dampened our Lederhosen, but not our spirits. By taking a chance on some of the local traditions and rubbing elbows with often proud and gracious natives, TCKs and their families can end up with a magnitude of incredible memories. And maybe even some truly mooving experiences. Thanks for being a loyal reader and leaving comments, Leanne. We are fortunate to have such family memories! Miss you all!